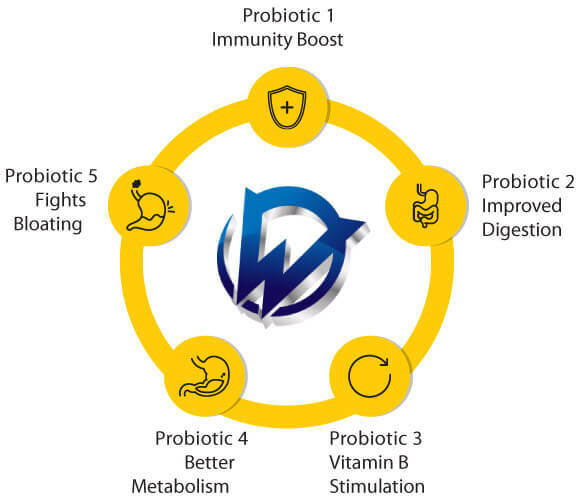 WonderPro has a super action of 5 probiotics in 1. Boosts Immunity : A body's health depends on your immunity to fight infections and hence diseases. In return, the immunity is determined by the population of good bacteria in the gut. Stress, long working hours, lack of adequate sleep, irregular food habits are modern days lifestyle factors creating a perfect imbalance of good and bad bacteria in the digestive system giving rise to problems of diarrhea or constipation. Wonderpro provides for the right amount of good bacteria for a healthy digestive system & immunity. Improves Digestion : Wonderpro extracts the right nutrition from the intake of food you consume and provides for a balance despite disturbed lifestyle habits. Helps Body Metabolism : Metabolism governs the body's fatigues & how you feel. WonderPro provides for the right probiotics which maintains the balance of bacteria thereby helping faster metabolism. Q : Is Wonderpro suitable for children? A : Wonderpro can be used by anyone over the age of 3. Q : Does Wonderpro contains sugar? A : Wonderpro is sugar free, and so is suitable for diabetics. Q : Do I need to take Wonderpro with water or any other liquid? A : Wonderpro can be consumed directly from the sachet without any liquid, but you can also sprinkle the powder into water or milk if you like. Q : How many days does it take to feel a difference with Wonderpro? A : The benefits on digestion and bloating are usually felt within a week, and if Wonderpro is taken regularly, then benefits to immunity and metabolism can be felt within a month. Q : Does Wonderpro have any side effects? A : There are no known side effects to consuming Wonderpro. However, it is recommended to be cautious if you have a compromised immune system, and start of with a low dose of Wonderpro. Q : When should I take Wonderpro? A : Wonderpro should be taken around the same time each day. If you are taking it particularly to improve digestion, it should be taken directly after a meal, otherwise it can be taken at any time of the day. Q : Is it OK if I take 2-3 sachets of Wonderpro in one day? A : Yes, there is no problem if you have multiple sachets of Wonderpro in a day, and it is recommended to take more than 1 sachet a day if you have more severe problems with immunity/digestion. Q : Why should I choose Wonderpro over eating natural probiotics, such as yogurt? A : The good bacteria in yogurt are often dead by the time they reach your intestine (due to exposure to air or the acid in your stomach), and this tends to minimize their positive effects. The bacteria in Wonderpro are in spore form and are encapsulated to protect them from the air and your stomach acid, so that they are alive and healthy when they reach your intestines, and can have the maximum benefit. Q : What is the expiry for Wonderpro? A : Wonderpro has an expiry of 18 months, however, a sachet should be consumed as soon as it is opened so that moisture does not affect the bacteria. Q : How should Wonderpro be stored? A : Wonderpro packs should be stored in a sheltered area, protected from high temperatures or moisture. Individual sachets can be carried around as long as they are consumed on the same day. Is Wonderpro suitable for children? Wonderpro can be used by anyone over the age of 3. Wonderpro is sugar free, and so is suitable for diabetics. Do I need to take Wonderpro with water or any other liquid? Wonderpro can be consumed directly from the sachet without any liquid, but you can also sprinkle the powder into water or milk if you like. How many days does it take to feel a difference with Wonderpro? The benefits on digestion and bloating are usually felt within a week, and if Wonderpro is taken regularly, then benefits to immunity and metabolism can be felt within a month. Does Wonderpro have any side effects? There are no known side effects to consuming Wonderpro. However, it is recommended to be cautious if you have a compromised immune system, and start of with a low dose of Wonderpro. When should I take Wonderpro? Wonderpro should be taken around the same time each day. If you are taking it particularly to improve digestion, it should be taken directly after a meal, otherwise it can be taken at any time of the day. Is it OK if I take 2-3 sachets of Wonderpro in one day? Yes, there is no problem if you have multiple sachets of Wonderpro in a day, and it is recommended to take more than 1 sachet a day if you have more severe problems with immunity/digestion. Why should I choose Wonderpro over eating natural probiotics, such as yogurt? The good bacteria in yogurt are often dead by the time they reach your intestine (due to exposure to air or the acid in your stomach), and this tends to minimize their positive effects. The bacteria in Wonderpro are in spore form and are encapsulated to protect them from the air and your stomach acid, so that they are alive and healthy when they reach your intestines, and can have the maximum benefit. What is the expiry for Wonderpro? Wonderpro has an expiry of 18 months, however, a sachet should be consumed as soon as it is opened so that moisture does not affect the bacteria. How should Wonderpro be stored? Wonderpro packs should be stored in a sheltered area, protected from high temperatures or moisture. Individual sachets can be carried around as long as they are consumed on the same day.